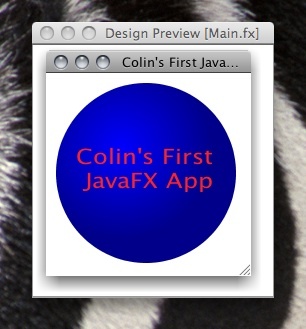 I've just run through the "Getting Started With JavaFX Technology" tutorial, and in a word: WOW!!! What is pretty amazing is the Designer Preview Window. When this is open you can watch your JavaFX app change as you change the code without the need for saving or recompiling or anything between changes. It's pretty amazing and very cool, especially when you drag-and-drop the code snippets into your code. New things just appear. There was one thing that struck me as a bit odd: you don't seem to need to be too good at closing off your statements with semi-colons, or separating array elements with commas. JavaFX seems to be quite happy if you do, and just has happy if you don't. I'm going to have to delve into the other demos and examples now. I'm curious to see what I can do with my relatively little Java programming knowledge. One thing is for sure, the development time for JavaFX apps is going to be PDQ.